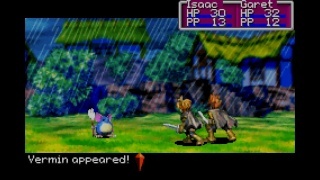 Created by Camelot and published by Nintendo Golden Sun is a gripping story-based RPG that has many unique gameplay features such as the unique psynergy magic system and djinni summons. The game's battle system focuses on the use of magic and summoning mysterious creatures know as djinn which you can equip to a character and summon them in battle. Your skills and magic change depending on which element your equiped djinn are and you can learn more powerful magic by using the magic you already possess. You can also summon powerful spirits to battle if you have multiple djinn of the same element and set them during battle. These spirits can do quite a substantial amount of damage to all enemies during battle. The story is typical roleplaying stereotype you cause a disaster to befall the world and are banished from your village and embark on a quest to save the world. There are some surprising plot-twists near the end of the game that I can't spoil, but the game does end with a cliff-hanger. This is a very important reason why Nintendo must release Golden Sun: The Lost Age eventually on the Wii U and until they do the game is essentially incomplete. Golden Sun is similar to Pokemon in the sense that you can use some of your abilities and psynergy to circumvent obstacles and solve puzzles that would otherwise be impossible to overcome. 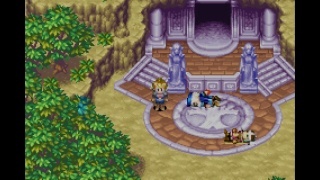 The puzzle solving in Golden Sun isn't all that complicated to just reach the end of a dungeon, but some secret djinn can be hard to reach without using your problem solving skills you can also find certain djinn on the world map, but they only appear at a specific point so exploration is key to finding all of the game's secrets! The battles are turn-based, but aren't difficult with the exception of the bosses and some of the late-game random encounters. There are many sidequests as well including the gambling machines to win prizes and the battle coliseum just to name a few. Golden Sun looks impressive visually as well. The game has a Psuedo 3-D look and the battles in particular look breathtaking. The variety of character models is also impressive in scale! The music also goes beyond the scale of most GBA titles and is some of the best you'll hear from a GBA game. Final Verdict: Golden Sun is one of the best first party roleplaying games released on the classic GBA handheld. The gameplay and battles are unique and enjoyable and the graphics are impressive for a game released on the aging Nintendo handheld. The music is beyond anything you'd expect from a GBA title and is easily one of the best you'll hear from a game on the handheld! The only disappointing aspect of the game is the cliff-hanger that'll leave you confused and if the sequel doesn't release on the Wii U Virtual Console service you'll be left with an incomplete game. Our final verdict is that despite the game's one major flaw you'd be foolish not to download this classic GBA RPG! Thanks for reviewing another Wii U VC title! Keep up the hard work. I still haven't beaten the game either. I'm near the end, but the enemies in the the final dungeon are thrashing my level 30-32 characters while the second to the last boss KO's my characters in one hit. Excellent review! Golden Sun is one of my favorite Gameboy Advance games, but I agree that it would be really bad if Nintendo doesn't release its sequel on the Wii U eshop. This game is my favorite Wii U exclusive Virtual Console title. Golden Sun is a brilliant masterpiece and so is your review of the game! I love this game lol. Golden Sun was my first GBA game and is still one of my favorites. Golden Sun is the best first person Nintendo RPG series ever in my opinion. Hopefully we'll get the other two games released on the Wii U VC soon! Booyaa! Awesome review dude! This is one of the best GBA games that I had the honor of playing! Hopefully Lost Age will be released outside of Japan soon! What's taking Lost Age so long to reach NA and EU? 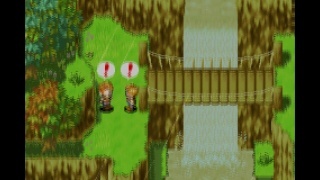 Golden Sun is a masterpiece and I'm sure that its sequel The Lost Age will be released eventually. I still have yet to finish the first one. GamerZack87 wrote: I still have yet to finish the first one. I finished the game almost a couple months ago, but failed to complete most of the optional quests and missed several Djinni.